1 Find a good large pot or sauce pan. A large pot is important because there is some splattering during the simmering process. 2 Simply put all the above ingredients in the pot, set it over a burner, uncovered, with just enough heat to allow a slow simmer. 3 Let this mixture simmer, making sure to stir gently about every ten minutes or so. I usually let this cook for at least two hours, two of the most deliciously fragrant hours of the year in our home. 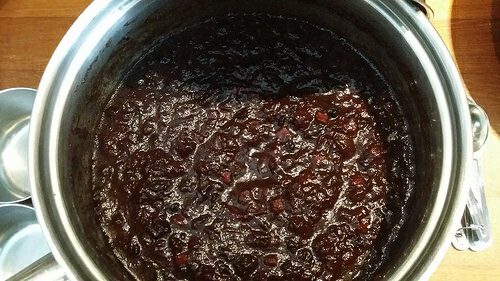 Toward the end of the cooking, the mincemeat should become quite thickened, with most of the liquid evaporated. As it gets to this point, you need to be alert so that the mixture does not burn on the bottom. Keep the heat low, and stir more frequently. 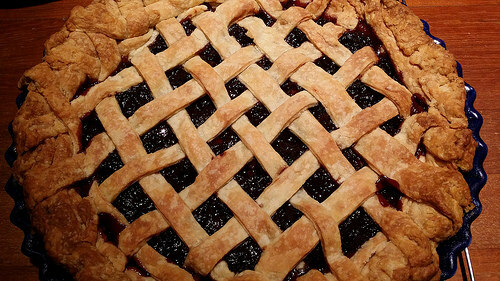 When the mixture has an almost marmalade-like consistency, the cooking is finished. Then, just remove the pot from the burner and set it aside to allow the mincemeat to cool uncovered. 4 As far as additions, this year I'll be adding some dried rhubard, and dried stawberry because I found them not very toothsome as is. I suspect, however, that they'll make wonderful additions to our holiday mincemeat. That's what I mean by being creative, and resourceful as well. 5 This recipe makes plenty for both a good-sized Thanksgiving pie, and also our Christmas holiday filled cookies. I'm enjoying just thinking about your preparing this wonderful recipe, a very fun way to anticipate the coming holidays.